Custom made to fit your needs. Ford F150 Super Crew Molle seat cover, for rear passenger side, aprox. 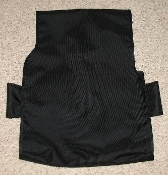 Molle panel size is 12" X 19". Adds extra storage space to your truck. Protects the tops of your expensive enterior. Made from 1000D coated nylon or 1680D Ballistic nylon with 1" nylon webbing set to PALS/MOLLE mil-spec standards, this will fit the twelfth generation (2009-2016) model and the 2017 model of Ford F150 Super crew (Raptor included) drivers side rear seat. Ensure your truck has the full sized four door= Super Crew. Please select model year, color, and material type.